A whopping 6.25 kg kamokamo was the clear winner of “The biggest kamokamo” competition, run by the organisers of the Seasonal Surplus Stall on their final day for this season, Thursday April 23. Mike’s winning kamokamo was grown in Waerenga Rd on a rich diet of compost and horse manure, while Hariata’s 4.3kg runner-up was also from Waerenga Rd. 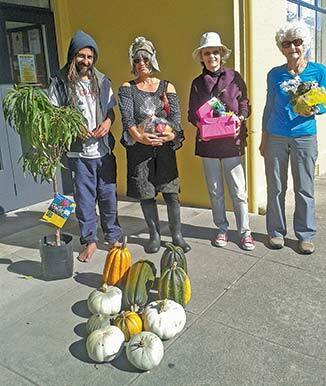 “Everyone loves a challenge, so we came up with the idea of running a light-hearted competition to see who can grow the biggest kamokamo, a vegetable that’s very popular with our regulars at the stall,” said Kathryn Smith, who conceived the idea, made and distributed posters and approached local businesses for prizes. Kamokamo seeds were distributed free at the stall for people who wanted to enter. Pumpkins also featured, though none reached the impressive size of “the biggest kamokamo”. The non-profit Seasonal Surplus Stall, now in its sixth year, is run by volunteers from Transition Town Otaki, from early October to late April each season.